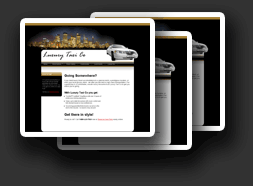 Making sure your website is as smooth and pleasant as the rides you provide. With FissionTransport™, You choose your level of design. Starting from simple templates to a fully customized look and feel, there is a design plan to fit any budget. FissionTransport™ sites are based on a powerful web system that gives you 24/7 control of your website from any computer with internet access. And it's easy to use! Each and every FissionTransport™ website starts with a personalized consultation from one of our representatives, at no cost to you. Complete the form below and we will contact you to begin.